Please check our pickup hours on the contact us page. You have UNTIL THE FOLLOWING SATURDAY at 3pm to pay for your items in person or online. If you require more then 7 days you can make a payment by credit card, interac or paypal and we will hold it an additional 7 days (Storage fees will apply). Storage fee (2.00/sq ft per week storage), small items we will usually waive the storage fee as long as they are paid for within the week. If NO payment is received within 3 days we will consider the items abandoned and your account would be suspended and the item would go back up for auction or offered to the previous back bidder (You will still owe the lost revenue if you wish to reactivate your account in the future and a security deposit or credit card). To reactivate your account you would need a valid credit card. If you are over 7 days late paying a 10.00 PER LOT late fee will also be applied starting on day 8 so please make your payment by interac email money transfer or paypal if you can not pick up your items within the allotted 7 days. Stored items here for more then 60 days we will consider abandoned and either resell, donate or dispose of them and invoice you any costs involved if any are incurred, we will not email or chase after you to pick up your paid for items so please DO NOT forget to come get them. The BUYER expressly agrees to indemnify the owners of damgooddeals.com, the Seller and their assigns harmless from and against all claims, losses, expenses, damage or liability, directly or indirectly caused by or resulting from an act, including the negligent acts or omissions of damgooddeals.com, or anyone acting in his/her behalf in connection with or arising out of auction. All bidders/buyers must be of legal age (18+years). You expressly understand and agree that the operators and owners of damgooddeals.com shall not be liable for any direct, indirect, incidental, special, consequential or exemplary damages, including but not limited to, damages for loss of profits, goodwill, use, data or other intangible losses (even if the operators and owners of damgooddeals.com has been advised of the possibility of such damages), resulting from: (i) the use or the inability to use the service; (ii) the cost of procurement of substitute goods and services resulting from any goods, data, information or services purchased or obtained or messages received or transactions entered into through or from the service; (iii) unauthorized access to or alteration of your transmissions or data; (iv) statements or conduct of any third party on the service; or (v) any other matter relating to the service. You agree to indemnify and hold the operators and owners of damgooddeals.com harmless from any claim or demand, including reasonable attorneys’ fees, made by any third party due to or arising out of your breach of this Agreement or the documents it incorporates by reference, or your violation of any law or the rights of a third party. The operators and owners of damgooddeals.com are governed by the laws of ontario canada without regard to its conflict of law provisions. 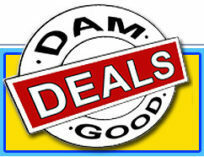 You and the operators and owners of damgooddeals.com agree to submit to the personal and exclusive jurisdiction of the courts located within the midland ontario area. The failure of the operators and owners of damgooddeals.com to exercise or enforce any right or provision of this agreement shall not constitute a waiver of such right or provision. If any provision of this agreement is found by a court of competent jurisdiction to be invalid, the parties nevertheless agree that the court should endeavor to give effect to the parties’ intentions as reflected in the provision, and the other provisions of this agreement remain in full force and effect. You agree that regardless of any statute or law to the contrary, any claim or cause of action arising out of or related to use of the Service or this agreement must be filed within one (1) year after such claim or cause of action arose or be forever barred.